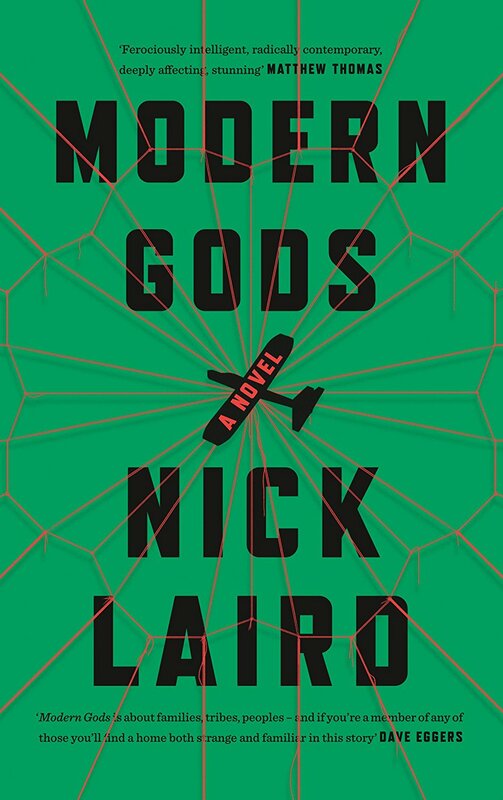 It’s surprising that the opening of Modern Gods wasn’t rewritten: two masked men open fire in a local bar while a band is playing, spraying the crowd with bullets from an AK-47. Somehow only five people are killed in the carnage but their deaths are brutally detailed with crunching skulls, “archipelagic” splatter, and blossoms of blood erupting through clothes. While the scene is later revealed to one of the many atrocities to unfold during The Troubles of Northern Ireland, it’s impossible not to shake the heavy shadows of the Bataclan, Pulse Nightclub, and Manchester Arena. Laird later reveals that one of his characters is connected to this act of violence, with the intention of challenging his readers and their sense of forgiveness, but it backfires. This character’s particular story needs a bloody past, but to think of all the possible attacks that could come at the hands of a Protestant militant, terrorism at a concert feels a particularly poor choice today — exploitative, lazy, and difficult to forgive. The intentions of the author become as questionable as those of his characters, handicapping the entirety of Modern Gods with this uncomfortably muddy opening. What incongruently follows this violent scene is a simple family drama about three siblings going back home to Northern Ireland for a wedding. Liz is a learned anthropologist and the author of the lightly innocuous but successful book The Use of Myth: How Lévi-Strauss Can Help Us All Live a Little Better, the success of which landed her on the presenting circuit for the BBC. While living in New York, she comes home one day to find her boyfriend in bed with a man, which rankles her despite their loosely open relationship. Feeling emotionally defeated, she takes her dog and flies home for her sister’s wedding. Before she leaves, she accepts a job as a BBC presenter for a piece on a new “cargo cult,” a religious group from an island off the coast of Papua New Guinea, and plans to fly out after the ceremony. It takes a long time for Liz to touch down in the jungle, so long that Modern Gods ends up a story about an Irish family with a strange jungle detour. So much of the book is spent at home going through the motions of a TV family drama: illnesses and past indiscretions are kept secret, siblings slide into that familiar space between rivalry and unconditional love, and snappy dialogue crackles between parents and their kids. 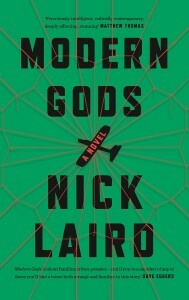 So much of Laird’s conceptual efforts are aimed towards reframing traditions and societal norms: he broadly circles around these notions in a way that situates Liz’s open relationship, Alison’s second marriage and Belef’s appropriation of Christian myth all inside the same vast anthropological ring. This curious proximity could lead to some vague ideas about people being their own creators, free to follow or dismantle those stories that came before them. It’s a thoughtful landing, but there’s still a brutal shooting lurking somewhere outside of this mark. By the end of the book, Laird shifts almost entirely to Liz’s story and lets the drama at home in Ireland fizzle out, despite devoting the majority of the novel the development of those characters. The shooter’s story is perfunctorily developed, tacked on at the end, and addressed in a way that makes it seem like Laird wants readers to consider it anthropologically, somewhere in the realm of modern love and modern faith. But it doesn’t feel right to fit in like that; it downgrades the visceral power of the scene into a hollow idea and renders its inclusion even more questionable. The incongruity of Modern Gods ends up being its downfall: its parallel threads can only resonate in the haziest of conceptual frames. The work ultimately feels underdeveloped and cobbled together, with pressure put on the reader to spare Laird the trouble and decide for themselves what it is all about.